You sure are giving your parents a run for their money. There are very few things that have made you happy this week, one of which is having your mom run up and down the stairs over and over. Guess it’s ok since you’re not giving me much time to get a workout it- baby calming and exercising have to serve double duty. You’re also a pretty big fan of Dance Dance Revolution, but you’re pretty picky about your song selection. Speaking of songs, your favorite song is the one you and I did squats to in prenatal yoga before you were born. I play it on my phone and you clearly recognize it. We dance around to it until you fall asleep or I can’t move anymore. You’re getting quite a grip! Usually on my hair or necklace, but every once in awhile you’ll hang on to a toy for a second or two. 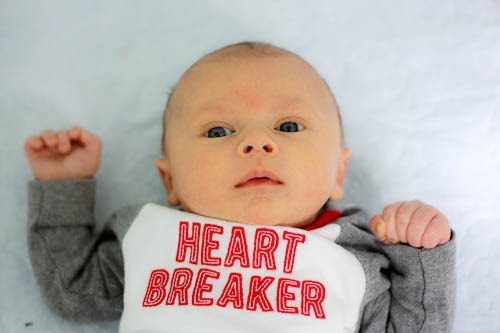 This week we celebrated your 1st Valentine’s Day– you were such a cutie in your little heart breaker outfit. 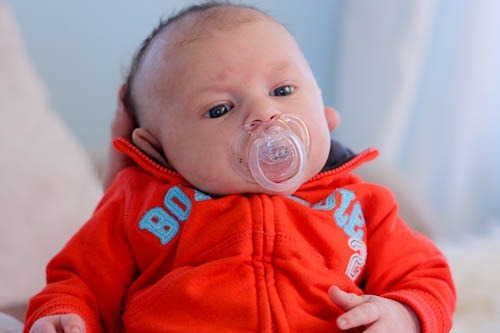 Good thing we didn’t buy the newborn size- you’ve just about outgrown most of your newborn clothes. Your mom and dad celebrated Valentine’s a day late, on the 7th anniversary of their 1st date- wow. Mom surprised Dad with babysitting by your grandparents and we went out to dinner. Of course we missed you tons and couldn’t wait to come home for baby snuggles. Your grandma was going to babysit your by herself, but when Grandpa found out he wanted to come to. Then of course your Aunt couldn’t be left out of the excitement either. I have a feeling this isn’t the only time you’ll require 3 babysitters. Hopefully you get your rebellious attitude out of your system before you’re a teenager. More of mommy’s friends came to meet you this weekend. You settled down for a couple smiles, but you mostly screamed at them. Luckily I don’t think they’ll hold it against you and just might come back and see you again. We’re trying so hard to figure out why you’re so unhappy. It’s certainly not for lack of hugs and kisses! Our latest theory is silent reflux. 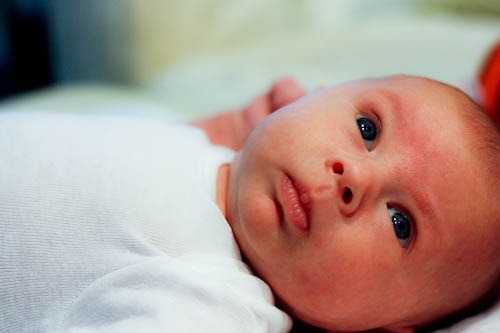 Poor little baby- you hate to go to sleep and when you do, you wake up screaming in pain. And heaven forbid we put you down! Hang in there bud, we’ll figure it out. A couple people have whispered the evil “C” word, but I’m not willing to go there yet. 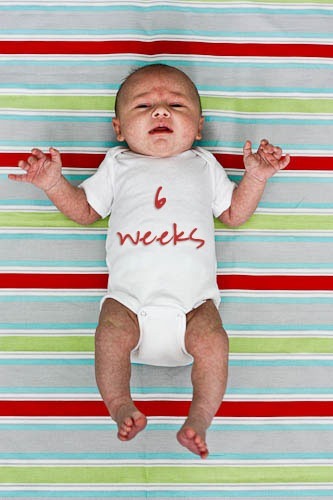 You started your 6 week growth spurt this week, so maybe you’re just working things out of your system. You’re certainly gaining weight like a champ. I can’t get enough of those cute chubby thighs! Oh so cute! I love the pic of you two doing Dance Dance Revolution together! Glad little peanut’s helping you to work out! 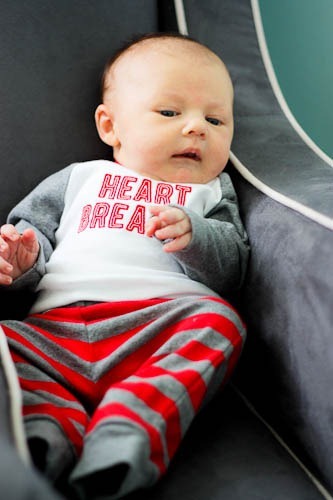 Oh my goodness – I did so many “workouts” with my baby. I would walk up and down the stairs while he slept. I also did squats, lunges, and some light kickboxing all while holding him. If he wasn’t sleeping when I started he was shortly into it. My baby is now 6 months old and I’ll still do stuff with him. This is why new moms cut off all of their hair. Go short, stop wearing any kind of earrings or necklaces, they will all get ripped out. it hurts more than the beauty is worth. Soon enough they will be 6 years old and you can have long hair again.